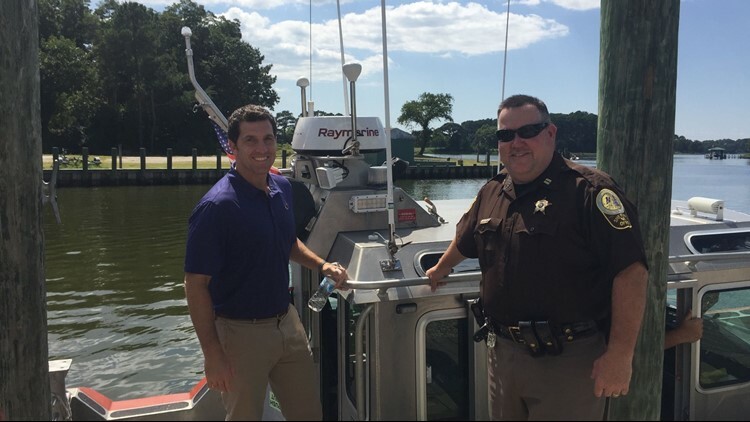 Rep. Scott Taylor steps aboard the Accomack County Sheriff's Office boat with Capt. Todd Wessells of the Sheriff's Office at the wharf in Onancock on Aug. 24, 2018. Taylor and Del. Rob Bloxom traveled aboard the boat to Tangier for an announcement. In the works since 2012, Tangier Island will finally get a jetty, according to U.S. Rep. Scott Taylor. TANGIER ISLAND, Va. (Delmarva Now) — Rep. Scott Taylor announced during a visit to the Eastern Shore of Virginia that Tangier will finally be getting a jetty that has been in the works since 2012. "I am happy to say today that the end of the federal approval process has happened. I'm proud to say they are going to start that process finally and construction will begin in 2018 and conclude in 2019," Taylor said during a briefing on Chincoteague on Friday morning. He later traveled by boat to Tangier Island from Onancock with the Accomack County Sheriff's Office and Delegate Rob Bloxom to make the announcement there. The purpose of the project is "to help protect the harbor and west channel from wave action and, during the winter, from sheets of ice that pile up and damage the islander's work boats, docks, and crab houses," according to a description on the U. S. Army Corps of Engineers website. The construction cost is an estimated $2.4 million, with the state of Virginia to provide 20 percent of that amount, or $495,000. Gov. Ralph Northam is expected to sign off on the state's share of the cost within the next few weeks, Taylor said. It was nearly five years ago that then-Virginia Gov. Bob McDonnell and Col. Paul Olsen of the U.S. Army Corps of Engineers traveled to Tangier to announce the signing of an agreement to build the long-awaited jetty to help protect the harbor. The project had been on the drawing board for more than a decade but federal funds were not available. Tangier is about 3 miles long and is home to about 450 people, many of whom make their living catching fish, crabs, and oysters as their ancestors have since the 1700s. Island watermen account for a significant portion — 13 percent, the most of any bay town — of the state's $30 million a year blue crab fishery, according to a recent study. Additionally, the island and surrounding seagrass beds, which act as a nursery for a wide variety of marine life, are a valuable ecosystem, scientists say. The island since 1850 has lost two-thirds of its landmass due to erosion from waves and sea-level rise, according to the authors of a 2015 study. Scientists, engineers, and planners are considering a range of options to ensure Tangier's survival: from building seawalls around the island, to using dredge spoils to build it up, to installing artificial oyster reefs to protect the shoreline. One protective measure — a mile-long rock structure along most of the island's western shore — was built in 1989 at a cost of $10.6 million. That has helped protect the island's airport. Additionally, six stone breakwaters were installed on the eastern side of nearby Port Isobel in the 2000s. A proposal to build a series of breakwaters offshore would be a more comprehensive approach to preserving and restoring land to the island, according to a 2015 study. However, that estimated cost could approach between $20 and $30 million, the study said. Taylor during his talk on Chincoteague also pledged to support nearby NASA Wallops Flight Facility, calling it a "unique national asset." Taylor had a recent conversation with NASA Administrator Jim Bridenstine about Wallops, he said. "The bottom line is, he, like we, view Wallops Flight Facility as a unique national asset that must never be shut down," Taylor said. "I want to publicly say that I stand committed, shoulder to shoulder" with delegations from Virginia and Maryland in both the House of Representatives and the Senate, "to hold the line on NASA, to make sure that not only do we not lose any potential folks who are employed there, but we add assets," he said, citing commercial opportunities related to the facility. NASA earlier this summer announced it is exploring ways to improve the relationship and become more efficient between its two campuses in Greenbelt, Maryland and Wallops Island. Results of a 90-day study are expected by late October. Ken Human, who recently retired from NASA, is leading the review team. Goddard formed a team to study and evaluate opportunities to improve the organizational structure and effectiveness of the relationship between Goddard Space Flight Center’s campuses at Greenbelt, Maryland, and Wallops Island, Virginia, according to a prepared statement NASA issued. "The importance of a synergistic relationship between the two campuses is vital to the future of each campus and Goddard Space Flight Center as a whole,” Human said. A NASA official at the quarterly luncheon meeting of the Wallops Island Regional Alliance in August said there is no threat to Wallops. Jay Pittman, the assistant director for strategy and integration at Goddard Space Flight Center and former Program Manager and Commander of NASA's Launch Range at Wallops Flight Facility, repeated that reassurance several times during the meeting. "There are valid technical reasons that make the Wallops Flight Facility fundamental to Goddard and NASA," he said. "Wallops does important work for NASA overall. For example, there's parachute testing that's relevant to a future Mars mission." Around 1,200 people work at NASA Flight Facility, including 280 civil service workers and more than 900 independent contractors. The NASA Wallops annual budget is around $250 million. Accomack County Supervisor Ron Wolff, who represents the Wallops area on the Accomack Board of Supervisors, during a question-and-answer period with Taylor said Wallops has a "vast" effect on the local economy. "The things that are done here cannot be done or replicated anywhere else in the country," Wolff said. "If anything happened, any type of reduction, due to the study of the Wallops complex, it would just be devastating here," he said, noting an "influx of several hundreds" of people come to the region for launches from Wallops. "The effect that has on our local economy is so vast," he said. Taylor also said he will be offering an amendment in the Fiscal Year 2019 Commerce, Justice and Science bill to give NASA legislative authority to reimburse the town of Chincoteague for the cost of purchasing land on which to locate new wells, and the cost to drill the wells, after chemicals used in firefighting foam were found last year in water samples taken from wells near a former fire training site at NASA Wallops Flight Facility. "The language will enable NASA to use the funds as available from its construction, environmental compliance, and restoration account to reimburse the town of Chincoteague for its cost," he said, adding he is requesting the full amount: $11 million. Tests in 2017 showed two of three shallow wells and an adjacent deep well that supplied Chincoteague's water had the chemicals at levels above the EPA’s lifetime health advisory level. A third shallow well also was found to have the chemicals, but at a level below the lifetime health advisory. The seven wells that have provided Chincoteague's drinking water are on NASA Wallops Flight Facility property, on the mainland. A pipe carries the water across, near the Chincoteague causeway, to the island's water-treatment facility. The former firefighting training area is located on the north-central side of the NASA Wallops main base, NASA said in a release. Since the chemicals were found in Chincoteague's water supply, the town has been able to supplement its water supply from NASA wells under an arrangement made previously. Additionally, NASA agreed to filter Chincoteague shallow well water, but that is an expensive measure — and one which an attorney representing the town called "short-term." Accomack County officials in May approved a conditional use permit for a 32-acre parcel where Chincoteague plans to drill new wells.